A couple of months back I decided to have a go at making my own sushi rolls and was really pleased with the results. 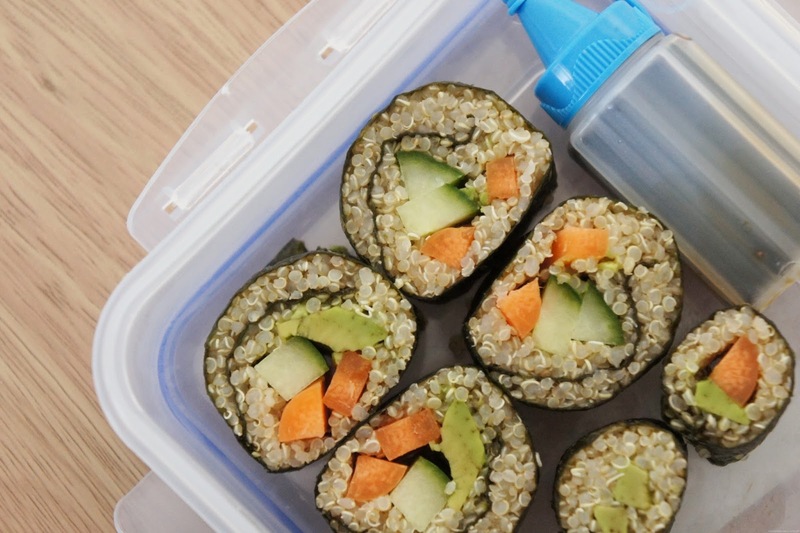 For a lunch box alternative to traditional rice sushi I like this leftover-friendly quinoa version packed with protein and raw veggies such as carrots, cucumber and avocado. These taste especially delicious dipped in some gluten-free tamari and would definitely make a nice change from a sandwich! When I finally decided that avocados were bearable to eat (it took a few tries!) this pitta version of a chicken avocado salad quickly became one of my favourite lunches. Simply combine vegan salad cream/mayonnaise, green pesto, gem lettuce and a meat-free chicken substitute with salt & pepper seasoned avocado slices and serve inside free from pittas for a tasty lunch. This final idea is definitely my favourite lunch right now and is based on a simple recipe I shared here in February. This chickpea salad tastes great with pasta but as many gluten-free pastas tend not to travel so well I've found that adding new potatoes and some homegrown spinach is a great alternative way to bulk out the salad for a filling lunch portion.